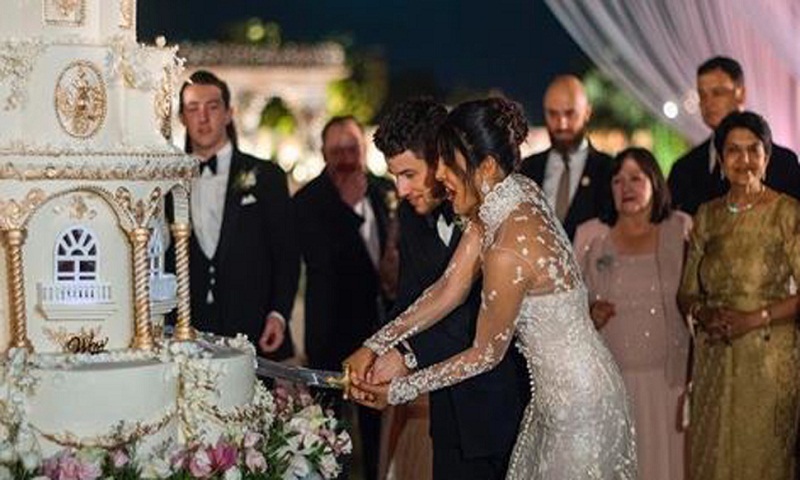 New Delhi: Power couple Priyanka Chopra and Nick Jonas tied the knot in Jodhpur's Umaid Bhawan Palace on exactly a week ago on December 2, 2018. Nick, who is one die-hard romantic at heart, posted a throwback picture from the wedding. The American singer shared a picture from their Christian wedding on Instagram to celebrate one week of marriage. He captioned the picture, "One week ago today?" Nickyanka' shared their wedding pics on social media soon after their wedding and they looked straight out of a fairytale! The Christain wedding had the bride looking stunning in a Ralph Lauren gown with a 75-foot long veil while the groom looked dapper in a black tux. The Hindu wedding had Priyanka wear a custom red Sabyasachi ensemble while Nick looked regal in an gold sherwani by the same designer. For the Delhi reception, Priyanka chose a peach lehenga while Nick wore a blue tux. PM Narendra Modi also attended the couple's Delhi reception and Pee Cee was overwhelmed by his presence. After the Delhi reception, we are excited to see pics from the Mumbai reception which will have a lot of Bollywood celebs in attendance, reports Zee News.